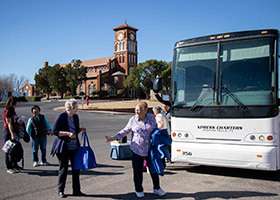 A group of women depart from the charter bus at the end of the pilgrimage March 9 at St. Mary Church in Windthorst. (NTC/Jayme Donahue) More pilgrimage photos. 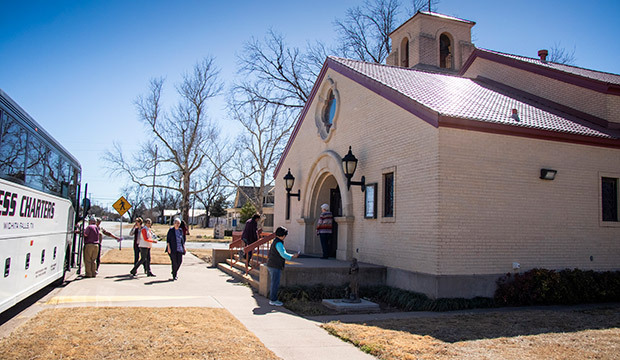 WINDTHORST — On a sunny, windy Saturday during Lent, parishioners from St. Mary in Windthorst and Our Lady Queen of Peace and Sacred Heart, both in Wichita Falls, set out to pray the Stations of the Cross during a pilgrimage to five churches deep in the Northwest Deanery. 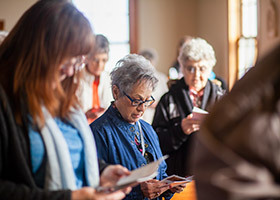 “What sparked the idea was three years ago when [St. Mary in Windthorst] was a Jubilee Year of Mercy [designated] parish, a group from Eastland, Strawn, Strickland, and Ranger traveled together to visit Windthorst. We thought, ‘we could do that,’” said Sherry Berend, a member of the Christian Mother’s Society in Windthorst. 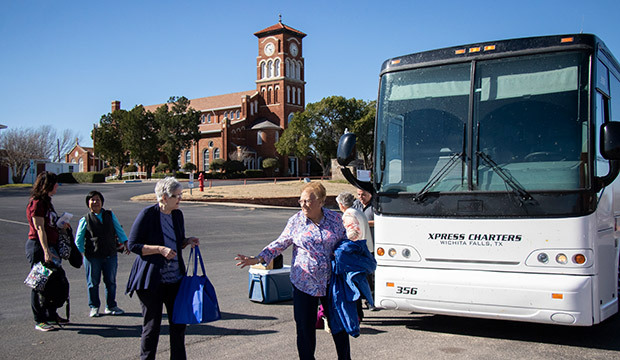 Last year a group, organized by members of the Windthorst Christian Mother’s Society, traveled east in a bus during Lent to parishes in Scotland, Henrietta, Nocona, Lindsay, Muenster, and Gainesville. This year, they did the same to the west, traveling to Olney, Megargel, Knox City, Rhineland, and Seymour. “Welcome to Olney,” said J.R. Smith greeted the 30 pilgrims who walked into St. Theresa Church in Olney. The church, located about 100 miles west of Fort Worth, lived up to the spirit of its patron with its simple presence, red brick with a white spire and gabled roof. Windthorst parishioners expressed their delight in meeting Smith, who has been the organist for some of their Masses for several years. 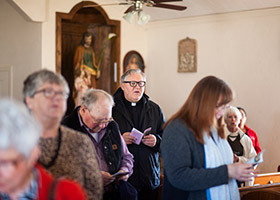 Father Michael Moloney, parochial administrator of St. Mary in Windthorst, led pilgrims in the first three Stations of the Cross. A large statue of St. Therese stood at the left of the altar next to votive candles. Returning to the bus, pilgrims were soon on their way to Megargel, where a worn road ultimately led to a pristine white gabled church with a spire on the front — St. Mary of the Assumption Parish. 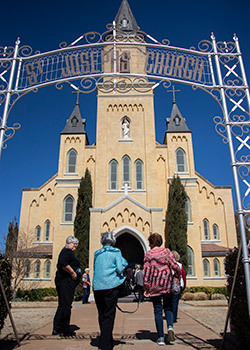 “This is a country church,” said Cecilia Detwiler, parishioner of Sacred Heart in Wichita Falls, while many other pilgrims commented on how much they liked the look of the outside of that church. Inside it featured stained glass windows of pink, green, orange, and blue. Its white walls were ornate with raised patterns of flowers and leaves. Tin tiles graced the ceiling. After praying Stations four through six — Jesus Meets His Mother, Simon Helps Jesus Carry the Cross, and Veronica Wipes the Face of Jesus — and exploring the church, the pilgrims were back on the road again. At times it seemed as if the same stretch of countryside was being replayed over and over outside the windows of the bus — dirt blowing across plowed fields and green fields, rows of giant white windmills, grain silos, water towers, and green tractors with humble houses dotted in the fields. “This is my hometown,” said Ruth Arias, another Sacred Heart parishioner as the bus passed through Munday. She pointed out an empty lot where her high school used to be. Munday High School is in a different location now. With no Catholic church in Munday, they attended Mass at St. Joseph in Rhineland, one of the stops on the trip. The bus passed the yellow and black sign of yet another Dollar General, a staple in these small towns, before pulling up to a beige church with a mission look and a cross on the top but no spire: Santa Rosa in Knox City. Mary Escamilla, who has been a Santa Rosa parishioner for 20 years, was delighted to meet the pilgrims from the east. She admitted that when the parish’s pastor, Father John Perikomalayil Antony, HGN, asked her to open the doors, she expected two or three ladies. “We have never had anyone make an effort to visit our poor church. We love it here,” she said. 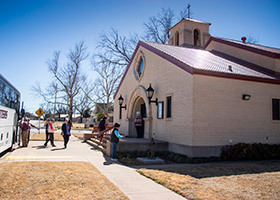 Escamilla explained that the church was built in 1948, is predominately Hispanic, and many parishioners are farm hands. Escamilla explained that Santa Rosa’s altar used to be “rather plain” until their current pastor, Fr. 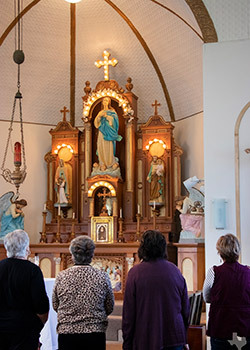 John, used his connections and found a talented Wichita Falls area parishioner to build beautiful wooden art niches on either side of the altar as well as a large wooden back altar to adorn the once blank wall. Back on the road again after the prayer, the pilgrims soon pointed excitedly off to the right as the spire of St. Joseph rose up amid fields, cows, grain silos, and yellow tractors in Rhineland. “A Cathedral in a Cotton Patch,” announced a black and white sign. Several of the pilgrims proclaimed St. Joseph as their favorite parish of the trip. “Rhineland reminded me of churches my husband and I have seen oversees. You can just stand and look for a long time and not see everything,” said Diane Luig, Queen of Peace parishioner. Rhineland is indeed a feast for the eyes with stained glass windows depicting the life of Christ, Biblical events, and saints. Ornate columns and buttresses hold up a beautiful acoustic ceiling that includes domed arches. St. Joseph also features many beautiful large statues including St. Joseph, St. Ann with Mary, Our Lady of Guadalupe, and the Sacred Heart of Jesus. Once at their final stop in Seymour, Father Jujuvarapu Bose, HGN, welcomed pilgrims to Sacred Heart Parish, a beige church with a gabled, red roofline. Fr. Bose belongs to the same religious order as various other priests from India in the diocese, the Heralds of Good News. “Now it has been three months since I completed my stay in the USA in this parish. And within two months, I already have seen twice snow fall,” said Fr. Bose as he explained it was the first time in his life to see snow. Some beautiful features of Sacred Heart are its triangular marble baptismal font at its entrance as well as a beautiful mosaic of the Sacred Heart in marble on the bottom part of the back altar.